I have had a long-standing series chronicling the fortunes and perceptions of the “English pub” and “Irish pub” outside Britain, and inside their home lands as seen by outsiders and sometimes local observers. The periods cover pretty much every decade since the 1860s. One day I’ll collect them in a monograph. My last sortie was examining the English pub or tavern as a totem of sophistication and refined comfort in 1920s-1930s America. The meme was used to promote suburban homes (fitted with an English tavern man cave), business district restaurants, and local bars and dance halls. I’ll return to this soon to profile a 1940 English tavern in Manhattan created by a successful German-American restaurateur, August Janssen, who saw which way the cultural winds were blowing. Janssen had run a famous German restaurant and bar in the city since the late 1800s, the Hofbrau Haus. He had been through this tempest before in WW I without going over to the other side as it were, but by 1940 he must have decided the time was right to offer an Anglophilic option. More soon on the 1940 venture and its menu. In a later period, I discussed the remarkably successful English pub at Montreal’s Expo ’67, and a couple of similar examples it encouraged in the city. One, the Sir Winston Churchill Pub, is still going strong as Winnies. These Canadian versions of the English pub helped set the stage for many more such operations in Canada, including the thriving Firkin chain in Toronto. In 1969, American entrepreneurs revived the same idea – as it wasn’t new, if I have shown nothing else. They had the brain wave to enlist an actual British lord in their venture, the 9th Earl of Hardwicke (1906-1974). The Earl, Philip Grantham Yorke, was a distinguished figure in British society: Etonian, former cavalry and parachute officer, and high-echelon company director. In a way he was a predecessor of some current Royal or aristocratic figures, Sarah Ferguson comes to mind, who capitalized on the enduring American fascination with emblems of British culture. The venture was described in a lightly mordant business article in 1969 in Long Island’s Newsday, see here. The principal promoter, Charles Stein, easily raised the money to build a dozen units and the idea was to license more once the core operation was afloat. The venture did take off and as recently as three years ago two Lord Hardwicke’s Pubs were still operating, one in Barboursville, the other in Charlottesville, both in Virginia. It appears they are now closed, and no pubs operate today under the Lord Hardwicke name in the U.S., but clearly some had a good run. Newsday profiled the venture with pithy phrases such as “tanned, trim individual sporting a broad necktie [Stein]” and “plastic pub”. The pub was literally plastic in parts, to emulate a far-away vernacular for commercial practicality and efficiency. The same thing is done today of course despite that fittings for some Irish pubs, in particular, are exported from Ireland as a lucrative business. In fact, according to Newsday, Stein had considered doing something similar for Lord Hardwicke’s Pubs but the cost was prohibitive, at the time. Although ads for Lord Hardwicke pubs lean heavily on the angle that they will be traditional (“The British pub. Authentically British. Every bit of it. The true pub.”), customers will not encounter oak beams, dart boards or even such English pub best sellers as gin and Scotch. The menus for the pubs will list eight so-called “Heartye sandwiches” running from either a “tayste frankfurter” or “ye melted cheese” both costing 45 cents to “royal roast beef’ at 85 cents. To maintain the Anglo flavor there is also something called a “British submarine” which turns out to be an English hero sandwich (90 cents). Of course there will be fish and chips. Imported Watney Red Barrel and London Lager beers at 50 and 75 cents a mug, as well as Schlitz at 25 and 50 cents, will be on draught. Although Stein … insists the interiors and exteriors of his pubs will be “very authentic” and styled by an English designer, they’ll all be as identical as Howard Johnson orange-roofed establishments. No stout English oak either. They’ll be made of molded Fiberglass components. “Originally we wanted to bring the English pub over here,” recalls Stein as he relaxes behind a metal legged oval desk in his office in the modem General Motors Building. “But the idea was not practical. They will be English for the unsophisticated person who has never been to England. It is easy to be a bit cynical reading such calculating efforts (which the Earl had no trouble signing on to, one might add). It would be more satisfying perhaps that Stein had a favourite local in London from his many business trips there and was inspired to set up a single, beamed bar with leaded casement windows. Ideal location? A manicured bedroom suburb, in Connecticut, say. The perfect retirement project. But (usually) that’s not how business works, in Britain, America, Canada, China, or anywhere. The Lord Hardwicke’s venture was good business thinking, in 1969 and no less today. Don’t you think someone will create soon a chain of North American Railway Arch bars? It’s just a matter of time. Some reading may think it weirdly apposite that Watney’s Red Barrel beer was to be sold in Lord Hardwicke’s pubs given its status as the bad boy of British beer, the one brew that more than anything stimulated the consumer beer lobby CAMRA and the real ale revolution. Red Barrel was a fizzy, pasteurized “keg” beer, trumpeted by its maker as the latest and greatest but arousing, finally, hostility from partisans of traditional, unpasteurized, hand-drawn ales. It just goes to show how wrong perceptions can be, or rather, how limited. Watney’s Red Barrel was sold in America from the 1960s through the mid-1990s, both in bottle and frequently on draft, as a premium product and was always regarded as such here. Like Lord Hardwicke himself, like the circa-1970 Beatles, Michael Caine, Sean Connery, Diana Rigg, and today’s equivalents, British products reaching our shores have always connoted prestige, a strange mix of charisma, sophistication, and class. The exported Red Barrel beer may have been, after 1971, the rebranded “Watney’s Red”, a revised, inferior recipe. Alternatively, it may have remained, for export purposes, the original, relatively high quality brew. Whatever it was, for an American curious to taste authentic ale from the place that invented the stuff, Watney’s Red Barrel was nectar. In a pre-wired time, little did he know or care what British beer obsessives thought about it. The English beer writers Boak and Bailey have just penned the latest on Red Barrel’s history and fortunes in the U.K. It is good reading, and see our comment which adds a 1960s colour video showing the Red Barrel in action on the bar – to the evident satisfaction of the chaps present, it appears. N.B. See my addendum in the Comments below. 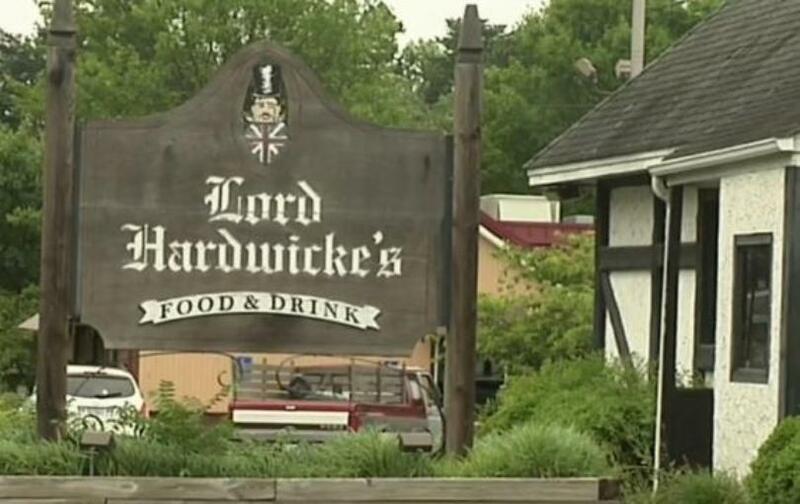 Note re image and quotation: the image above is from a CBS19 (Charlottesville) news story on the closure of Lord Hardwicke’s Pub. The quotation is from the 1969 Newsday article linked in the text (via Fulton Historical Newspapers). All intellectual property therein are the sole property of the lawful owners, as applicable. Image and quotation used for educational and historical purposes. All feedback welcomed. Some further thoughts: Charles Stein and his partners were clearly ahead of their time by envisaging the franchising of the Hardwicke pubs. That system proved very successful for a number of Irish pub chains in recent decades, among others. The Hardwicke promoters (three Americans and the Briton mentioned) were not alone in seeing the potential of the concept early. Other chains did arise more or less contemporaneously based on a somewhat similar idea, the Tudor-style Steak and Ale restaurants (founded 1966) come to mind. But as for many pioneers, the Hardwicke group had a great idea not perfectly realized. By this, I mean that subsequent research suggests the Hardwicke pub chain reached a maximum of six, company-owned pubs. A New York Times business story, in 1971, stated that the franchise idea was abandoned in favour of the Hardwicke company investing in various consumer leisure businesses (see p. 46). The six pubs were all in the Washington, D.C. area, which would take in the two Virginia outlets mentioned. The other investments proved successful, and further sources state that Hardwicke continued operation until the mid-1980s. Further, it is well to remember that, in any country, any type of restaurant finally is local. To be sure it can offer a foreign experience to varying levels of authenticity. But everything is a compromise in this sense, even as a foreign-flavour restaurant is fully capable to offer good enjoyment to patrons for a long time, as clearly happened with the Hardwicke pubs. Finally, not a little ironic is the fact that the pub chain idea succeeded magnificently in the home of the pub: Britain. Wetherspoons is a good example, but there are many. Did that change “the pub?”. It did surely, for better and worse. That is the story of business evolution, everywhere.